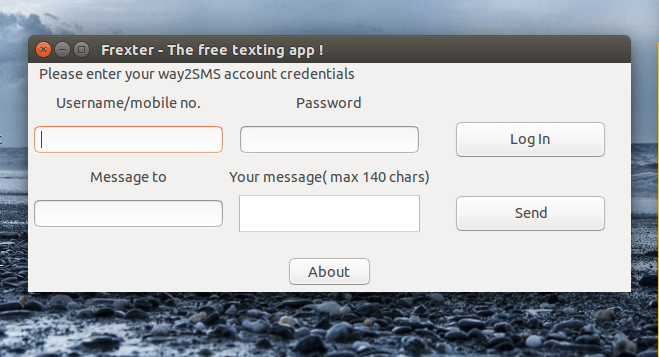 I had mentioned in my earlier posts of writing a script for sending free sms using way2SMS.com website. Recently last week I have completed that script with dedicated GUI for it capable of cross-platform applications. As usual I have used cookielib and urllib2 modules of python to trick the website of being used through a browser. For GUI, I have simply used glade which creates a xml for GUI blueprint and using gtk builder , the GUI actually comes to play. For using the app in your own pc, you need to install python gtk module. A simple pip install would do that. It is also often found to be pre installed into ubuntu by default. Next, for developing GUI , Glade in conjunction with gtk was used. A good tutorial I have found here by gnipsel. Refer to these set of tutorials to create your own GUI using graphical interface of glade and importing the glade file to source python code. Look at the screen shot for this app . #print "Error while logging in." #print "Error while sending message"
#print "SMS has been sent." Once you have completed the above mentioned tutorials understanding above source code would become self-explanatory. Every python code for an app would need its corresponding glade file. So I am attaching a zip folder below . To run the app in your linux system , try to install python module gi or gtk+3. Incase you have to edit some changes to my app’s GUI, install glade 3.16 from the official website. That’s it. Enjoy free texting and do feel free to comment doubts or suggestions here.